Recently, I watched Studio 54, a documentary film by Matt Tyrnauer that chronicles the rise and fall of the famed Manhattan discotheque that was the hottest spot in New York City in the 1970s. In its heyday from 1977 – 1979, the club, owned by Steve Rubell and Ian Schrager, attracted crowds that included A-list celebrities like Mick Jagger, Andy Warhol, Michael Jackson and Liza Minnelli and people from New York’s vibrant LGBTQ community to dance to the latest disco platters and indulge in sensual, and often illicit, pleasures. The film frames the disco scene as a reaction to the politics of the 1960s and early 1970s: as defeat in Vietnam and Watergate undermined young people’s faith in politics, it was time to leave protest behind and have fun. In one sense, the film argues that the indulgences of the “Me Decade” were a sign that youth culture was no longer focused on struggling for social reform. However, the film quickly undermines that framing by challenging preconceptions of the disco era as a time when American popular culture turned its back on political engagement, revealing the ways in which Studio 54 provided people, both as individuals and as members of marginalized communities, a space to exist free of fear of rejection and even potential violence. The scene that Tyrnauer documents was a vital link in a chain linking 1960s radical liberation movements to our own movements seeking to extend liberalism’s promises of freedom and dignity to marginalized groups. The club broke down social boundaries that divided people along lines of race and sexuality, allowing Black, white, straight, cis and queer people to share space free of judgement. That said, Studio 54’s celebration of acceptance existed in profound tension with its selectivity: a sense of social equality defined the scene inside the club, but a seemingly arbitrary selection process decided who would get in. Admission was often based on people’s appearances or the clothes they wore: being unshaven, wearing polyester, or anything else that revealed that one came from the “bridge-and-tunnel crowd” risked the doorman telling potential patrons that they would not be getting into the club. In 1978, at the height of Studio 54’s popularity, WBBY, Walden College’s campus radio station, sent Mark Slackmeyer to cover the club. At the time, Zonker, who was training as a competitive tanner, was in a funk. With the passage of Proposition 13, California had been forced to close the state’s tanning clinics, making it impossible for him to keep training. Mark suggests that Zonker tag along with him as a way to get his mind off of tanning. GBT’s take on the disco scene was pretty clear: he believed it was a culture in which shallow pleasures and the worship of celebrity for its own sake were the only currencies; in Trudeau’s vision of Studio 54, one’s legitimacy depended on having them, or at least aspiring to. Moreover, disco represented a shift away from the sense of social engagement that had defined youth culture only a few years earlier. Mark’s analysis of disco puts him squarely in the camp of the people who took part in the infamous “Disco Demolition Night” at Comiskey Park in 1979. While the event, at which a dumpster full of disco records was blown up between games of a Chicago White Sox/Detroit Tigers doubleheader is remembered for the ensuing riot, scholars frame the event as a backlash against the popularity of a musical genre associated with gays and Blacks. Trudeau’s depiction of Studio 54 is simultaneously right on the money and missing critical elements. No doubt that the Studio 54 scene reflected a growing fascination with celebrity, an outcome of what some critics have called a cynical and frivolous response to a “crisis of Western confidence” which was rooted in a “problem of legitimacy” of political leaders. But in other ways, Studio 54 represented not a break from 1960s values, but a continuation of them. While Trudeau clearly saw little of value in the culture of Studio 54, one line in the arc reveals how he could have understood the scene differently. Trudeau hints at the possibility that what was going on at Studio 54 represented more than a simple celebration of style over substance. Mark tells Zonker at Studio 54, a man is “judged by his moves, not the colour of his skin,” a reference to Zonker’s setback on the tanning circuit. Given the extent to which acceptance – along racial, but also gender and sexuality lines – was central to the Studio 54 scene, the reference to one of Martin Luther King’s most familiar lines is significant for its framing of elements of disco culture as logical extensions of King’s message of tolerance and acceptance. King scholars and activists from the LGBTQ community and their opponents have long debated where King would have positioned himself in terms of the struggle for LGBTQ rights. Michael G. Long argues that while, in his lifetime, King had, at best, an ambivalent position on the issue, he also had an “unqualified belief that the government has no compelling reason to abridge or deny an individual’s freedom to love and marry whomever he or she chooses.” Moreover, Long also points out that King’s widow, Coretta Scott King, had a long history of activism in support of LGBT rights. The South African anti-apartheid activist Reverend Desmond Tutu maintains that King “would no doubt have supported the courageous struggle against the discrimination of lesbian, gay, bisexual, and transgendered people.” Studio 54 may have unquestionably celebrated style and flash over political substance, but, by bringing people together to experience joy regardless of who or what they were, it also embodied key elements of the community-based consciousness that was at the heart of the sixties culture that Trudeau seemed to be longing for. By focusing on how Studio 54 embodied one dynamic of its cultural moment – the mindless worship of fame for its own sake – GBT blinded himself to another, namely the ways in which the disco scene opened up new possibilities of freedom and acceptance on an individual and a community basis. Trudeau’s failure to see this is frustrating because, by introducing King’s words into the arc, he left a door open to the possibility of delivering a much more politically nuanced analysis. 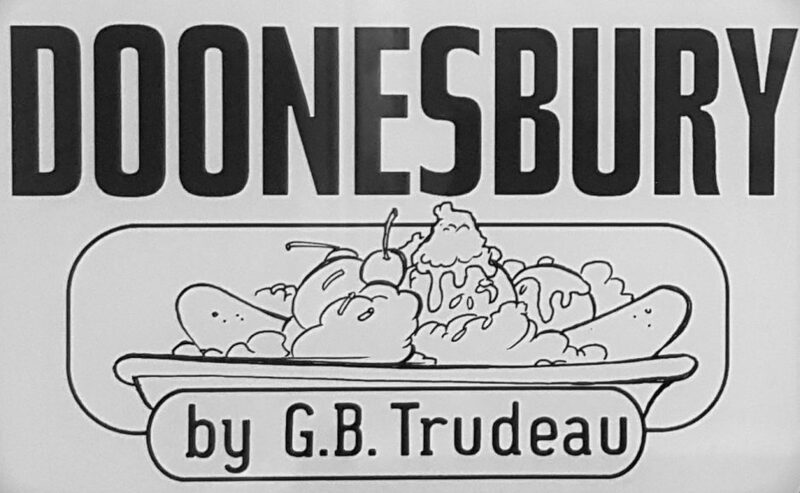 Besides that, Trudeau’s offhand dismissal of the scene flies in the face of the fact that by 1978, GBT had already proven that he was willing to use his voice to normalize gay identity in the funny pages. In 1976, Joanie fell hard for Andy Lippincott. a fellow law student. When Joanie asked Andy if the feelings were mutual, he revealed that he was gay. Andy became a quasi-regular Doonesbury character, and the strips documenting his struggles with, and eventual death from, HIV/AIDS are some of GBT’s most moving and ground-breaking work. The fact that Trudeau was willing to risk controversy by incorporating an explicitly gay character into a mainstream syndicated comic long before such a move would have been widely accepted speaks to his commitment to using his art to advance the best values of his generation. But the fact that he couldn’t see beyond the glitz of Studio 54 to get at how disco was giving queer people the opportunity to gain a better sense of acceptance speaks to, perhaps, how a largely unfamiliar environment and culture limited his understanding of what was happening. ‹ Previous“Jews Make Awkward Overlords”: Two Comics About Jewish Identity and Israel.